Two-centered and four-centered arches share something in common—a pointed peak. It’s not surprising that both are commonly found in Gothic and Gothic-inspired architecture. But a three-centered arch—sometimes called a ‘basket-handle arch’ or ‘Anse de panier’—closely resembles an ellipse, which puts it in a field of its own. This depressed type of arch, like the Segmental and Drop arch, can be used when the design requires the rise—or height—of the arch to be reduced. While segmental and ‘elliptical shaped’ arches both share a rounded top, the elliptical variation provides the benefit of a clean vertical transition, and respects traditional design principles. A true ellipse is the shape created by making a diagonal section-cut through a cone or cylinder. The ellipse has two focal points and a constantly changing arc radius. It can be difficult to determine if an arch is a true ellipse, or just one composed of simple tangent arcs, swung from three centers. Either way, elliptically shaped arches are more commonly found in traditional homes based on colonial styles—though their use depends more upon the skill of the architects, millwrights, and finish carpenters. I’ve heard some carpenters say (and I won’t mention any names!) that the popularity of segmental arches—sometimes one of the most boring and ugly forms of architecture—results more from a lack of knowledge and technique than from an understanding of classical forms—both Gothic and Colonial. These carpenters believe that elliptical arches—or, at the very least, three-centered arches—are far more attractive, but that the technique is beyond the skill of most contemporary carpenters. I don’t necessarily agree. I don’t think the segmental arch should be completely avoided. A segmented arch forms a pleasing and handsome frame, as long as the arches (the rise, the radius, the span) are nearly identical in size. In the first part of this series, I shared some images of segmented arches gone wrong. But, when designed and executed properly, a segmented arch forms a pleasing and handsome frame, as long as the arches (the rise, the radius, the span) are nearly identical in size. But, if the openings have variable spans, a three-centered arch is a better answer! At this point, I can’t help but mention Gary Striegler’s article in JLC about building an arched passage door. I’m including a PDF of that article here. It’s a critical part of this study, both because it will help readers form a better understanding of complex arches (arches with more than two centers, and elliptical arches), and because Gary’s article provides techniques for constructing a three-centered arch, which is much easier than milling elliptical molding! In fact, mill shops often use a similar technique to create their elliptical moldings, sometimes using five or more centers to create a more accurate elliptical shape. This coffered three-centered arch passageway features raised panels and uses the Ionic capitals of the pilasters as imposts to provide visual strength and support. 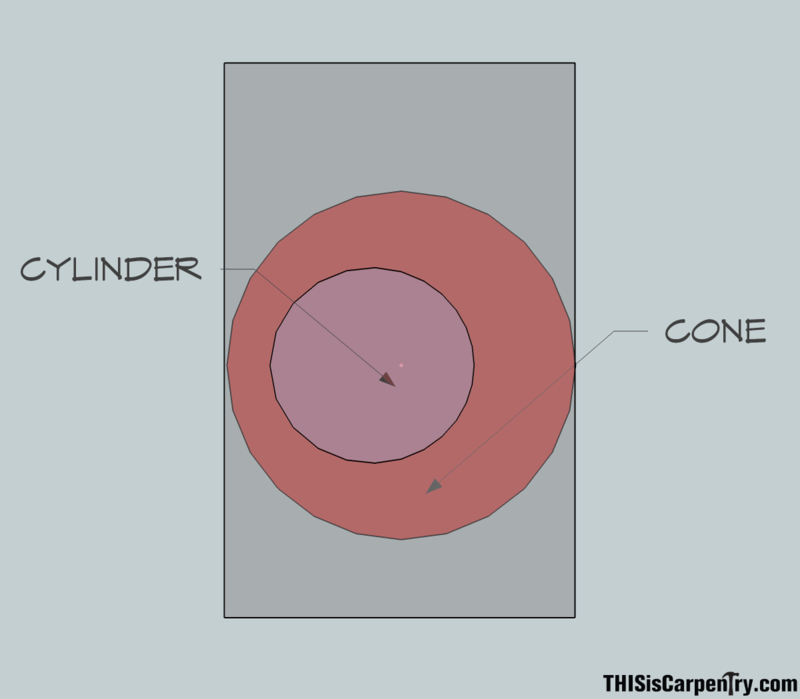 Another example of where a three-centered arch is easier on the carpenter, as opposed to a true ellipse, is in a coffered passageway. The curved panels of the head only require two different radii. In the photo to the right, you can see that the panels across the top share the same curvature, and panels with a tighter radius are used as the arch terminates on each side. Getting back to the purpose of this article—how do we layout this pseudo ellipse? Well…it all depends on what you are given to work with. Although being involved at the planning stages is ideal, most of the time it’s not a reality. Hopefully, the following Quick Reference Guides will help you deal with any ‘curve’ you’re thrown. This layout is for the classic three-centered arch. You only need to know the required width or span of the arch. The rise of the arch will be determined by proportion only. This layout is used when you must fit an arch within a predetermined height and width. This layout is used for creating a three-centered arch when the two radii to be used are predetermined. This is the situation used in Gary Striegler’s article. Keep an eye out for the last part in this series, on Four-Centered Arches! Thank you, thank you! This is what I have been wanting to read for some time. I don’t get to do many arches and always struggle on making it just right. You have shed some light on how we can do this as contemporary carpenters. I will say your right about the beauty of the segmental arch when its used like that. I’m one of the carpenters your referring too (or at least was) about feeling that they look boring. I still feel that way to a degree mostly because I’m all about being different, and it seems that most carpenters only do segmental arches because its easier, or because its “to much work” to do the 3 centered arches. I still feel that 3 centered arches are much more pleasing and graceful IMO. But I now feel humbled and more educated. I look forward to a project where I can use this new knowlege. Thank you! Three-centered arch design works well for aprons in tables. I made an occasional table in alder with ebony trim and mortise caps. As I was building it, I felt it lacked some aesthetics. I created, free-hand, what I now realize after reading this excellent and scholarly article was, if not a pure three-centered arch, was a close second cousin. I would have preferred to have done it right a la Murdock. Well done and thank you. Jack, would you happen to have a picture of your table. I have a woodworking / cabinet shop and that design sounds interesting. Thanks! After I started the research on this project, I began to notice this shape being used in a lot of different places. Furniture design was one of them. While reading The American Vignola, by William R. Ware, I saw this shape used for the channels, or ‘flutes’, in the columns of the Greek Temple on Illissus. I knew that Greek moldings used elliptical curves, as opposed to the circular curves of the Romans, but never noticed this detail before. good stuff indeed! I am itching to do a three-centerd arch all of a sudden. I am totally guilty of doing too many segmented arches. While they have their place, a three-centerd arch is clearly best for some applications– it has so much more character! It’s very good for geometrical layout of traditional architectural detail. It’s where I learned to layout handrail volutes, and it has a lot on ellipses and approximations of ellipses, and a thousand other worthwhile things. Of course, it’s written by architects, so it only covers the big first step, design, not the rest of the problem -how to actually make these things. Excellent! Thank you for the link Jed. That sounds like a great book to add to my library. Thank YOU for another great article! Where would this magazine be without Todd Murdock! I’m just happy to be a part of the team. Where would TiC be without Robert Walker!!! Let’s face it, the “three-centered arch” is an old elliptic “cheat sheet” (but a very good one). As far as traditional stair work was concerned, elliptic stairs have almost always been drawn from two-radii. Not only was the stair layout and construction easier and more straightforward but the accompanying handrail face-molds could all be trammeled (you can draw an ellipse from a circle but you can’t draw an ellipse from an ellipse). (Now I’m wondering how to draw and inclined or obliquely inclined cross-section of a cone and what kind of an ellipse that would be? Thanks for your insight on this. I’ve always been fascinated by complex stair work, and really enjoy learning about your craft. I can now see how an oval shaped stair would be preferable over a true elliptical shape. Thanks again! 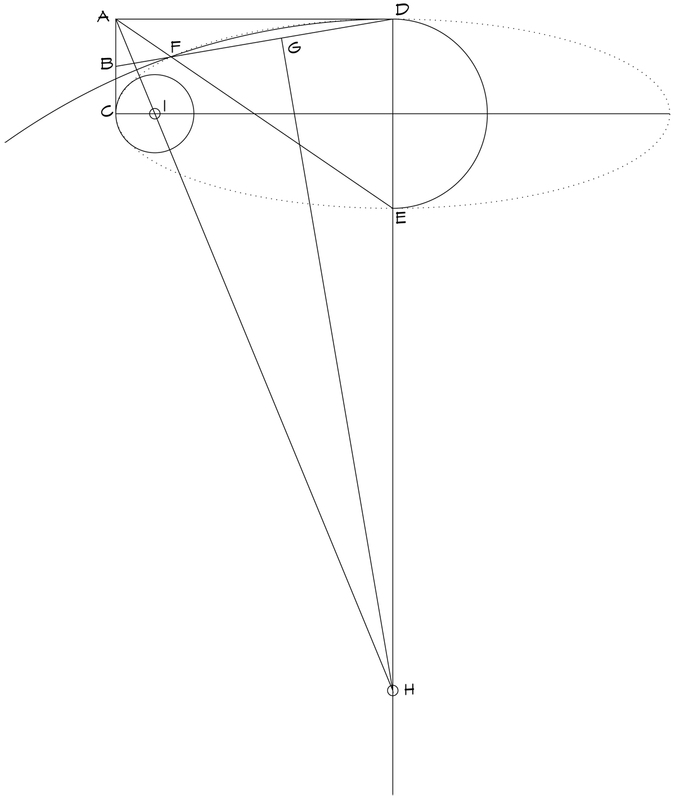 Oh — and here is a shot of a cone and cylinder that create the same ellipse. I’m still trying to wrap my head around it. Thank you for another helpful article. I am printing out all the quick references to add to my file at the shop. I have my fathers old Architectural and Graphic Standards which has a page of conic sections for drawing ellipsis and I can’t understand them even when I’m looking at them. Fortunately, I also have a book on veneering techniques which has a page showing how to draw an ellipse with a pin, a string and a pencil. Now that I can handle! I thought I might share yet another drawing method along with a true elliptical comparison for both. There are several methods but this is the one that I’ve found which most closely approximates a true ellipse. (and thanks to Asher Benjamin 1827). Awesome! Thanks for sharing this method. I came across several different methods in my research, but had not seen this one before. The method I used was from George Collings’ book, Circular Work in Carpentry and Joinery. It was the most commonly used method I found. Here is another common method. I have been playing with the Asher Benjamin example you posted and I’m having some difficulty. For shapes with a short rise, or small ‘minor axis’, the arcs don’t seem to be tangent. They follow the ellipse very closely, but seem to be missing a possible extra center? A five centered approximation? Here is an example, can you spot something I’m doing wrong? Thanks again Jim! Thanks for the great article. It is good to see several examples of the calculation that I can apply to the arch design in almost any situation. I have built several (5) three-centered arches on the interior of homes, and each one had different considerations for aesthetics. I found that in most cases with an 8′ ceiling, the oval approximation just didn’t fit aesthetically with the ceiling height. It brought the columns down too low in order to clear the ceiling. This is mostly because all of the openings that I was trimming out were between 5′ and 10′ wide. So, I apply the golden ratio relationship whenever possible to see how it might work out. 1. The height of the spring line (i.e. top of columns or height of the arch at the edges of opening). When determining this height, the golden ratio can be a helpful guide for dividing up the relationships. 2. The height of the larger arch above the spring line. This is usually determined by the ceiling height and trim requirements. The distance between the top of the arch and the spring line will be my working space for the arch layout. 3. Where are the centers of my circles? To determine the center of the large arch, I use the golden ratio (1.618) against the width of the opening. This will give me a radius that is 1.618 times longer than the width of the opening. Using this radius, I start at the high point of my arch and draw the larger arc. (Hopefully, it swings above my spring line at the edges.) To draw the smaller circles, I simply use the method in the color sketch above. (draw line AD, and square off of that to make H3) The point where H3 crosses the spring line is the center of the smaller circle. In general, I start with the larger arc, working within the constraints of my spring line and maximum height, and then use the method above to locate my smaller circles. Of course, I always have to stand back and look at it to see if it is working in the space. I use craft paper cutouts taped in the opening when discussing the design possibilities with the customer. You’re right Todd, I couldn’t make this work either…it seems that Benjamin Ashers’ method only works when point H falls inside of point E. This has forced me to re-write his book a bit (ha ha). I think I’ve fixed the problem but it’s late and I’m not sure. I’m having fun with your excellent article and I hope you don’t mind. I don’t mind at all! Your input helps augment the story. Awesome just the info I need for what I do. Thanks. My next arched built in will have a three seg each. How simple to do. Phenomenal article! I am always amazed how you can take a potentially confusing subject full of mental gymnastics like arches and break it down into very manageable, easily understood components. Thanks a ton for doing what you do. Great article. Ive really learn a lot from. Thanks for sailing. The big smiley face did not go unnoticed. Let me try this again auto correct stinks. Great article, Ive learn a lot from what you’ve done here. Thanks for sharing. The big smiley face did not go unnoticed..
I’m so exicited at stumbling upon TiC website! Unfortunately many of the older craftsmen have or are leaving us for the cozy workshop in the sky taking with them the great techniques/methods of our trade. So glad to see that there is still a premium placed on those techniques/methods. So tired of hearing “git ‘er done”…quality over quantity any day!!!! I am neither an architect nor carpenter, but I think the world would be a better place with a profusion of three-centered arches. They are, I think, the most beautiful and graceful iteration of the most compelling and ubiquitous structure in the history of archtecture. When the central arc segment is large, finding an area clear enough to draw it out can be difficult to say the least. Applying trig to the situation to reduce central radius to a more manageable size especially with workers asking questions along the way can be very daunting. Instead of using a single center to draw from a smaller arc can be drawn with the arc rays drawn as reference. This is very tedious but area needed to draw the center arc is reduced. Another way to shorten the center arc radius for drawing out in a more compact area. This method of reduction reduces drawing technique to linear segments or x and y in cartesian plane. From the center to center of the middle and side arch, point ab, divide that into a number of segments each of those segments we’ll call them d. Then for how much each segment would decrease in size from the apex of the arch to the center of smaller side radius use the following system of calculations. If D = radius, and d were to equal the length of each segment as measured along the x axis per numbered segment of arc or arch length then tan theta= ( points ab/desired # of segments)/(radius length) = g, take whatever #g is which represents the angle and then take the tan^-1 or arctan of that number, so (arctan g )= theta . Now that you have the angle given in numerical form , we’ll call theta. (d sin theta) (segment #) = reduction in height of each numbered segment. The more segments the smoother the arch will be. Thank you Todd for the very informative explanation. I had figured out how to create the first two arches of the 3 point arch on my own, but was not quite sure how to complete the top portion. I love your website and will definitely bookmark it for future reference. this is the beauty of geometry.